The Vervet Monkey is a species that has been around for many years. It is considered to be an Old World monkey and is a member of the Cercopithecidae family. This species of monkey is native to Africa; and it has seen numbers soar over the last few years alone. So how can a Vervet monkey be recognized? First of all, the Vervet monkey’s face is completely black; and it offers a small white fringe of hair. Overall, the Vervet monkey body colour is grey a mottled shade of grey. Though, the male Vervet monkeys are considerably bigger than the females. They are bigger in size and length; with males weighing anything up to eighteen pounds and measure out in length at twenty four inches. Whereas females are going to weigh anything between seven pounds and twelve pounds; and can measure out to around nineteen and a half inches. The Vervet monkey’s feet, hands, ears and the tip of the tail are all black. Female monkeys will have darker coats than males; though their whiskers are going to be lighter usually white or a very pale shade of yellow. They will differ from every monkey; and each monkey is different from the next. They will not all be the same size or weight, they can vary. For the most, the Vervet monkeys usually are found in the Southern part of Africa and the East region of Africa also. These are all the areas in which the Vervet monkeys can be found. The monkeys love areas such as mountains regions, woodland, rivers, savanna and coastal forests also. However, the Vervet monkeys are adaptable and can live in highly fragmented vegetation areas. Though there have been a small number of Vervets which have been found, or rather introduced to areas such as Florida and Barbados. Those numbers are very small however. 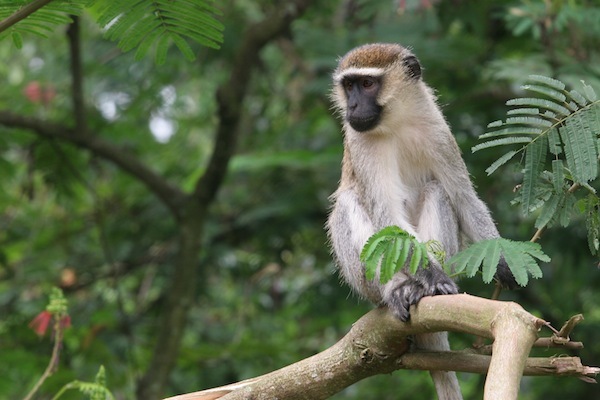 Vervets can usually be found near rivers; but they are adaptable creatures because they can live in urban and rural areas which are quite good for these animals. When males are young and immature, they will stay in a small group before reaching maturity. Once they are old enough, they will be moved to a neighbouring group; but more often than not, the male will move on to another group with his brother or older male which is a way to get protection against other monkeys. There shouldn’t be too much of a problem with aggression between males if the monkeys have interacted with one another before. Though, if the males transfer during the mating season, things might get a little heavier. However, for females, they will not leave their group; they will stay in the same group for life. It is only the males that transfer from group to group to avoid inbreeding and such; though for Vervet monkeys, they will socialize with others at their own ranking. Most of the times, it will be those lower ranking that will be the target of aggression from males higher ranked than them. Though there is more conflict in the group if one monkey attacks or harms a member of one particular family. The monkeys do offer alarm calls and recognition; this is to avoid coming into contact with predators outside the group such as baboons, snakes, leopard, eagles and other larger species. If a Vervet monkey sees a predator, then they will sound a warning and if a juvenile makes a call, all of the group will run to their aide. What Do Vervet Monkeys Eat? Vervet monkeys usually eat a variety of fruits and leaves; and a variety of flowers, seeds, foliage and even gum. They can also eat bird’s eggs and even feed on sap. 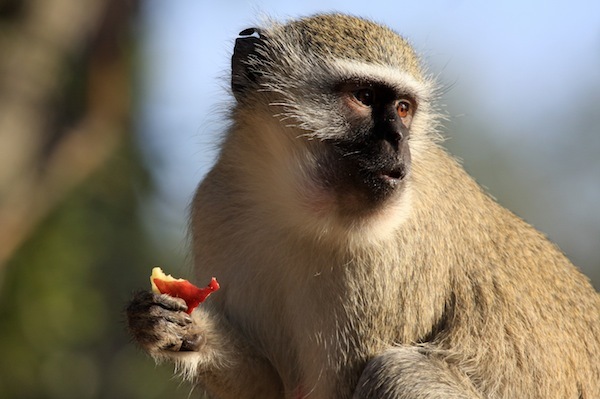 More often than not, the Vervet monkeys are going to stick to fruit but their diets can include things such as small mammals, birds, termites, vegetable foliage, and some insects also. Usually, the female Vervet monkeys do not have a lot of mates. Throughout their life, they have a small number of mates; males on the other hand have several mates during their lifetimes. Though, there is not a lot known about how the Vervet monkey reproduces. It is known that usually a female will give birth once a year to one young. Very rarely will there be twins from a female; though it is known that the female mature at around 2 years old whereas males take a little longer. Most females love to actively take a huge amount of time raising the babies.